It's all over and both sides get a point apiece. 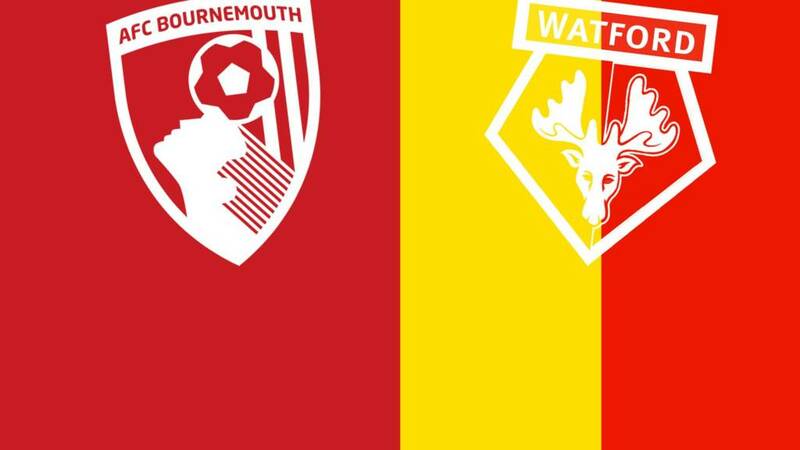 Bournemouth striker Glenn Murray had a mixed match as he scored but missed a penalty, while Cherries keeper Artur Boruc made a massive blunder for Watford's equaliser. BBC Sport's Mark Mitchener at Vitality Stadium: "Five weeks ago here, Bournemouth lost two left-backs to injury within 10 minutes, including record signing Tyrone Mings, who is out for the season. "Today, the same has happened to Watford's right-backs, with first Allan Nyom and now Ikechi Anya forced off. Anya went down with what looked like a muscle injury after clearing the ball forward, and the Watford physio almost immediately signalled for a change." We are in added time here and it looks like the game is going to end in a draw unless someone produces a bit of magic. A mixed day for Bournemouth striker Glenn Murray, whose miss from the spot could prove costly. He's missed the target with two efforts to go along with the penalty failure. BBC Sport's Mark Mitchener: "Etienne Capoue has two metaphorical bites at the Cherries - first challenging Glenn Murray and then bundling over Adam Smith, with the second effort earning Bournemouth their fourth penalty in four meetings with Watford. "But, unlike Lewis Grabban and Yann Kermorgant who scored on two of those occasions, Murray joins Ian Harte who missed at Vicarage Road last season. "It's a purple patch for the purple-clad keeper Heurelho Gomes, who saves Murray's spot-kick minutes after keeping out Steve Cook's acrobatic overhead kick from the edge of the box." Watford are furious with referee Michael Oliver giving a penalty for Adam Smith going down after a challenge with Etienne Capoue. Watford keeper Heurelho Gomes is booked before guessing the right way to save Glenn Murray's spot-kick. Steve Cook - Bournemouth's centre-back - has an overhead kick from outside the penalty area tipped over by Watford keeper Heurelho Gomes. Glenn Murray puts a far-post header wide for Bournemouth after a right-wing cross. Ikechi Anya limps off injured and is replaced by Juan Carlos Paredes. That will be a concern for Scotland fans. BBC Sport's Mark Mitchener at Vitality Stadium: "Watford defender Allan Nyom, who has been limping around for a while since being fouled by Matt Ritchie, is finally withdrawn in favour of Victor Ibarbo, with Ikechi Anya moving back to right-back. "Two substitutions by Bournemouth have them lining up in an unfamiliar 4-5-1 with goalscorer Glenn Murray the focal point. Nervous times at both ends of the field with 15 minutes left." Injured striker Callum Wilson is in the Bournemouth crowd today. Odion Ighalo runs at the Cherries goal but goes down as he is sandwiched in between two defenders. He appeals for a penalty but it isn't given and he chases after referee Michael Oliver to make his case. Ikechi Anya is through on goal for Watford but isn't clinical enough as his shot is blocked by keeper Artur Boruc. Watford are carrying much more of a threat now. A corner for the visitors is only cleared to Ben Watson just outside the area and his shot is blocked away in a crowded penalty area. Bournemouth bring on defender Adam Smith for midfielder Marc Pugh. BBC Sport's Mark Mitchener at Vitality Stadium: "The home fans rise as the clock ticks round to 55 minutes as there is a minute's applause in memory of former club photographer and programme editor Mick Cunningham - and during that minute, there are chances at both ends as Bournemouth threaten from a corner and Ikechi Anya fires a tame shot wide for Watford. "But the hosts have looked jittery at the back ever since Artur Boruc gifted Watford that equaliser." Hornets striker Odion Ighalo twice leaves Bournemouth defender Sylvain Distin wanting before having a shot blocked. Watford midfielder Ben Watson then produces a well-struck half-volley which comes back off the crossbar. Things are livening up here now. Matt Ritchie's back heel gives overlapping Cherries right-back Simon Francis space to cross and he delivers a ball into Glenn Murray whose tame header is saved. It turns out Murray was offside. Referee Michael Oliver appears to be in a generous mood this afternoon. Watford left-back Nathan Ake slides in to take out Matt Ritchie but only gets a telling-off from the ref. Plenty of width from Bournemouth as you can see from their average positions in the first half - Matt Ritchie (30) and Simon Francis (2) combining down the right with Marc Pugh (7) and Charlie Daniels (11) effective down the left. BBC Sport's Mark Mitchener at Vitality Stadium: "Watford are level on the stroke of half-time - and keeper Artur Boruc only has himself to blame, after taking a gentle back-pass from Sylvain Distin, taking a touch to control in, but inexplicably passing it straight to Odion Ighalo, who gratefully accepts the gift-wrapped chance as Boruc takes a tumble trying to keep him out. "The home fans look a little deflated after that curious end to the first period." I'm not sure Artur Boruc's red face has disappeared yet as the teams go back to their dressing rooms for the break. The Bournemouth keeper's mistake let Watford, who were struggling to create any chances, level. It's not even Christmas yet but Cherries keeper Artur Boruc gives Watford a gift of a goal. Boruc has a pass intercepted by Ighalo and the Hornets striker sells the keeper a dummy before sidefooting home. Bournemouth striker Glenn Murray is not happy with Watford midfielder Etienne Capoue. The ref gives both a talking-to but no cards are shown. TV replays show Capoue might have accidentally-on-purpose stood on Murray's foot. Naughty. Murray quickly takes revenge with a rash tackle on Capoue and is booked. Watford will have to chase the game now but they've scored just five goals in the top flight this season - that's the lowest now that Newcastle have taken the lead against Manchester City. The Hornets are struggling to create chances as they have yet to have a shot on or off target. Glenn Murray went close on a couple of occasions before his first goal for the Cherries. It came following good build-up from the hosts too. BBC Sport's Mark Mitchener at Vitality Stadium: "Bournemouth have been threatening this for a while - Simon Francis and Matt Ritchie combine well down the right to work some space, and Ritchie's pin-point cross is met with a textbook header from Glenn Murray, who raises his arm aloft to salute his first Cherries goal. "It's the first time Watford have conceded before half-time this season - '1-0 to the champions' sing the home fans." Forget what I was just saying about the home side not capitalising!! Glenn Murray gives the Cherries the lead. He wasted a good chance earlier but makes no mistake this time as he expertly heads in Matt Ritchie's left-footed cross from the right wing. Here's how the game is panning out at the moment. The ball has been in Watford's final third more but the Cherries have struggled to capitalise. Watford have let in only six goals this season which is the joint second lowest in the Premier League. They are standing firm again, with the home side having failed to make the most of the sniffs of goal they have had. "It looks great business now for Bournemouth, taking Glenn Murray from Palace on deadline day for £5m. "He's a forward I like, big and strong, and now he gets his opportunity with Callum Wilson being out." Callum Wilson was the Cherries' top scorer in the Championship last season, while injury saw Glenn Murray only start 12 Premier League games in 24 months at Palace. Joshua King has the kind of pace which would worry any defender. He makes another burst in a central position and picks out Glenn Murray only for his fellow striker's touch to let him down as a Cherries attack breaks down. BBC Sport's Mark Mitchener at Vitality Stadium: "This game was sold out several days ago - and the Bournemouth faithful waste no time in reminding the visiting Hornets of how last season's Championship table finished. 'You nearly won the league', the packed-out home fans sing." Watford have half-hearted shouts for a penalty when a shot from Allan Nyom hits Charlie Daniels but the Bournemouth defender's arms are by his side and it wasn't even 100% it hit his hand. "Bournemouth don't have a depth of squad to accommodate for Callum Wilson's injury and others that are out with long-term injuries. Eddie Howe will be looking at what he can do in the January window." Wilson is out for at least six months after injuring his knee against Stoke. Defender Tyrone Mings and winger Max Gradel are also absent with long-term injuries. BBC Sport's Mark Mitchener at Vitality Stadium: "Watford's fans may be crossing their fingers that they finish with 11 players on the pitch today - which they've not been able to do on their last two visits to Dorset. "Gabriele Angella saw red in both of those games, in January 2014 and January 2015, but subsequently had both of those red cards rescinded. No worries for him today... he's on loan at Queens Park Rangers. "But keep your eye on referee Michael Oliver, as this fixture has seen a penalty kick awarded to Bournemouth on each of the last three occasions." Glenn Murray fails to get his head to a left-wing cross but was offside anyway. He looks a bit rusty. Another Bournemouth attack down the right should have led to a goal. Matt Ritchie crosses for Glenn Murray at the far post but the striker can only nod high from six yards. Cherries striker Joshua King shows his pace on the right flank as he makes space for a decent cross which Hornets keeper Heurelho Gomes comes out to gather with Bournemouth striker Glenn Murray lurking. When it comes to using English players, these two sides are top and bottom of the table. Watford have used just two English players in the Premier League this season (Troy Deeney and Ben Watson) - the lowest in the league - while Bournemouth have fielded 13 English players, more than any other team. Watford manager Quique Sanchez Flores says he "loves" the "high-quality" refereeing in the Premier League. "If it's not a strong foul, carry on." BBC Sport's Mark Mitchener at Vitality Stadium: "Bournemouth will be honouring one of their most loyal fans at today's game. Mick Cunningham, 55, a lifelong supporter who had been the Cherries' club photographer and programme editor, died last Sunday after being taken ill at Bournemouth's game at Stoke. "The programme, which had been a labour of love for Mick for so long, has his picture on the front cover, with fans and players past and present paying tribute. "The Bournemouth players have decided to wear black armbands today, while there will be a minute's applause in the 55th minute of the game to mark Mick's age." Bournemouth manager Eddie Howe: "We're going to be a different team now with Callum being out. "It is up to everybody to step up and give more. Last season we were so consistent with our team selection, so this challenge is new for us. But the players who have stepped in have done well so far. "I don't think you'll see a real change in style, but we are going to have to adapt." "Last season's top two sides in the Championship have made decent starts, with both getting early wins under their belts and putting points on the board to dispel any fears that they might not belong at this level. "Clearly, how Bournemouth respond to the crushing blow of losing chief goalscorer Callum Wilson will go a long way in shaping their fortunes. Back-up strikers Glenn Murray and Yann Kermogant now have a much bigger role to play. "Watford's defence has been their strength this season. Over-reliant so far on Odion Ighalo for their goals, surely it's only a matter of time before Troy Deeney breaks his Premier League duck." BBC Sport's Mark Mitchener at Vitality Stadium: "The biggest question Bournemouth today: how do they replace top scorer Callum Wilson, who was stretchered off at Stoke last Saturday with a cruciate knee ligament injury which will keep him out for six months? "The Cherries start today with the strike partnership which finished the game at Stoke - Glenn Murray and Joshua King, summer signings from Crystal Palace and Blackburn, with Lee Tomlin and Yann Kermorgant as alternatives to come off the bench." Bournemouth lost striker Callum Wilson to a long term injury in the defeat at Stoke last week and they replace him with Glenn Murray, who makes his full debut for the club. Forward Joshua King also comes in for the benched Lee Tomlin. Bournemouth XI: Boruc, Francis, Cook, Distin, Daniels, Ritchie, Gosling, Surman, Pugh, King, Murray. Watford make one enforced change following defeat by Crystal Palace last time out. Jurado has a hamstring injury so Nathan Ake starts at left-back with Ikechi Anya pushing further forward. Watford XI: Gomes, Nyom, Prodl, Cathcart, Ake, Capoue, Watson, Abdi, Deeney, Anya, Ighalo. Mark Lawrenson thinks this match will end in a 2-1 victory for Bournemouth. "It is only the start of October but the outcome of this game could prove vital to who stays up in May," reckons our football expert. Bournemouth have already had troubles on the injury front this season. Not only have summer signings defender Tyrone Mings and winger Max Gradel suffered long-term injuries but striker Callum Wilson has now joined them in the treatment room. The 23-year-old is out for at least six months after he ruptured the anterior cruciate ligament in his right knee against Stoke last Saturday. Bournemouth pipped Watford to the Championship title last season as the two teams earned automatic promotion to the promised land of the Premier League. The Hornets have made the better start to life in the fast lane of English football, although there is not much in it as Watford have nine points and the Cherries seven after seven games.